Special little people call for special little gifts. Practical gifts are a favourite of mine to give and if they can be personalised then that’s all the better. After all, what child doesn’t love their name emblazoned on their belongings? 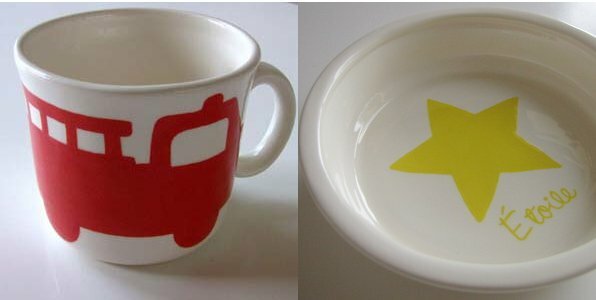 The stunning range of crockery at Ensparkle Ceramics is designed and hand painted by Sydney mum Helen Bremner. Cups and plates make perfect memento gifts and Helen will personalise ceramic pieces for your special person making them feel extra special indeed. The range is fresh and modern in sleek white featuring your chosen painted silhouette image. You can choose from a train, tow truck, fire engine, heart, princess crown and a star. If you’re after something a little different, Helen does accept custom orders, so you’re in luck! I’m quite smitten by the ceramic jug with its fancy cobblestone cow. I love the idea of bringing this one-and-a half-litre milk jug to our breakfast table to replace the plastic bottle. Alas, it would require a mop accessory since we all lack careful pouring skills. It’s still pretty nevertheless! These delightful wares are available from Ensparkle Ceramics and are priced from $44.95. The personalised ceramic bowl costs $69.95 and delivery is available all over Australia.